I am glad to see that Jonathan Bright's photo of Nessie has gone live on the mainstream media. The major papers are running it now as you can see below. 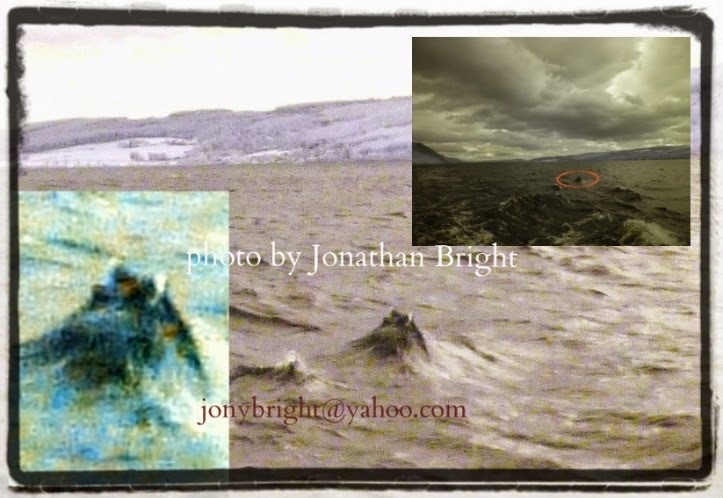 My original article on Jonathan's picture was top google hit for this picture, but that won't last long as people visit these sites for the latest evidence of Nessie. Well done, Jonathan, on raising Nessie awareness. And, no, I do not think it is a wave. P.S. We have had innumerable comments by sceptics that this is a wave. More than enough in fact, so let this picture bask in its temporary glory ... so no comments for this article. 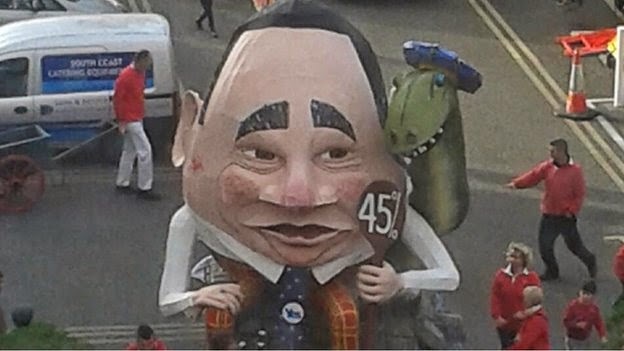 An effigy of the Scottish First Minster, Alex Salmond, will be burned at the traditional Lewes Guy Fawkes bonfire tonight. All I can say is, what has poor Nessie done to deserve this? It was off to Stirling this Friday as I made the short trip from Edinburgh for a day of paranormal lectures with Nessie surfacing somewhere along the line. The event was into its second of four days at the Albert Halls just outside the town centre. I bought a whole day pass which gained me entrance to the day's five lectures, starting with our very own cryptid at 10am. The speaker was Jonathan Bright, who will be familiar to regulars here as the taker of an alleged photograph of Nessie back in 2011. I say alleged because not all agree on the identity of the object in the picture. This blog takes the view that it is Nessie, others interpret it as a wave. Jonathan gave some background on his own general, paranormal investigations at home (in Greece) and beyond. But his photo took pride of place in the presentation as Jonathan discussed how he saw a horse like head in the picture which followed in the tradition of the good old water horse of old. He then went through the various ways in which the Loch Ness Monster could be interpreted as a paranormal phenomenon. I'll develop that more as I describe the day. The second talk by Jonathan Downes on the Chupacabra was cancelled. I don't know why and I was disappointed not to hear and meet Jon for the first time. As a result of this gap, the Q&A session for the Loch Ness Monster talked was extended. After this, the third scheduled talk was by the "Paranormal Contractor", Stephen Mera. This concerned his various call outs to investigate strange goings on across Britain.There was no theory here but a series of tales of his adventures as he came across phenomena which were explicable and inexplicable. Swinging lights were explained by a kid with a yo-yo, but water which was observed to travel across a ceiling like a snake and drop down like rain was beyond his powers of deduction. Equally, if not more compelling was the talk by Nick Kyle of the Scottish Society for Psychical Research. Ironically, he was a replacement for another call-off, Hayley Stevens, who is a ghost-hunting sceptic. I say ironic because Nck is the opposite of Hayley in his conclusions. Some fascinating tales, pictures and audios made for an interesting case for phenomena which require an explanation beyond what the sceptics normally offer. Then again, I have not read their explanations for these events and so will say no more. The final talk of the day was by Peter McCue and entitled "Orchestrations of the Trickster". This took me back to the musings of Charles Fort, from whom we derive the word "Fortean". Fort speculated on whether the odd stories he had compiled over the years were evidence of a Cosmic Trickster playing tricks on mankind. How much Fort believed this I don't know, but Peter McCue brought it up to date by suggesting phenomena such as UFOs, Bigfoot and Poltergeist activity had the same origin in a higher intelligence. By implication, this would extend to other cryptids. This is not a new theory, but it still baffles me as to the motives of such a "Trickster" who persists in this apparently puerile behaviour for millenia. Suggestions are welcome. So ended an interesting day, but how applicable was all this to the Loch Ness Monster? Firstly, I would say that Nessie hunters of the past such as Tim Dinsdale and Ted Holiday would have been quite at home with these proceedings and would happily have taken their seats here. Indeed, seeing one or both of them presenting a talk would not have been out of the question. There are a plurality of readers of this blog who subscribe to a paranormal Loch Ness Monster. Again, they would have no problem turning up at such a conference. But quite how this all hangs together is vague (to me at least). I, myself, believe in paranormal phenomena and have even subscribed to a paranormal Nessie in the past. From what I discerned this Friday past, it is not clear whether that theory has developed much. To take a paranormal position will get rid of supposed problems such as food supply and the lack of a carcass. However, to say Nessie is a solidified thought form looks as easy to say as the sceptics saying Greta Finlay only saw a deer. Easy to say, but how do you convince those outside your "camp" of this? Perhaps a more solid theory explaining this will be forthcoming, in which case I will pay more attention. In the meantime, you are free to post your musings and theories. On a final note, I talked to Malcolm Robinson, who has written various books on strange phenomena. He tells me that he hopes to publish a new book on the Loch Ness Monster entitled "The Monsters of Loch Ness" by the end of the year. I look forward to that, though note this is the same title as the late Roy Mackal's book. Can you do that? And to finally bring this article back to the blog's position, Malcolm agrees with me that Nessie is a water breathing animal!